Jesus was known as “a friend of tax collectors and sinners” (Matt. 11:19). Although meant as a criticism against Jesus, I personally like this designation. Jesus made it a point to make meaningful connections with those despised by polite society — something that set Him distinctly apart from the religious leaders of His day. The religious leaders were so starched in self-righteousness that they avoided the wrinkles that result from contact with sinful humanity. Jesus, however, was “full of grace” (John 1:14) — something that allowed him to interact with sinful and hurting people in a way that the religious leaders did not understand nor comprehend. He knew that “those who are well have no need of a physician, but those who are sick” (Matt. 9:12). As a follower of Jesus, I want to befriend the disenfranchised and desperate, the poor and the oppressed, and those who are easily overlooked, avoided, and despised. Among other things, Kolkata is a place known for its homeless masses. Estimates of homelessness in Kolkata range from the hundreds of thousands up to a million. Over the past several years I have come to know most of the homeless people who live on the sidewalks near the guesthouse where I always stay on my visits here. One family in particular has several children, one of which was kidnapped a couple of years ago. This family has staked out its little slice of sidewalk to call their own. When I am here I always make it a point to buy them meals or give them snacks. This afternoon, I watched as a couple of our girls walked over to this family and gave them the sack lunches we provide for our students at noon. They not only gave them their lunches, they embraced them — something that does not often happen. More often these children are pushed out of the way or scolded by passers-by for getting in their way. 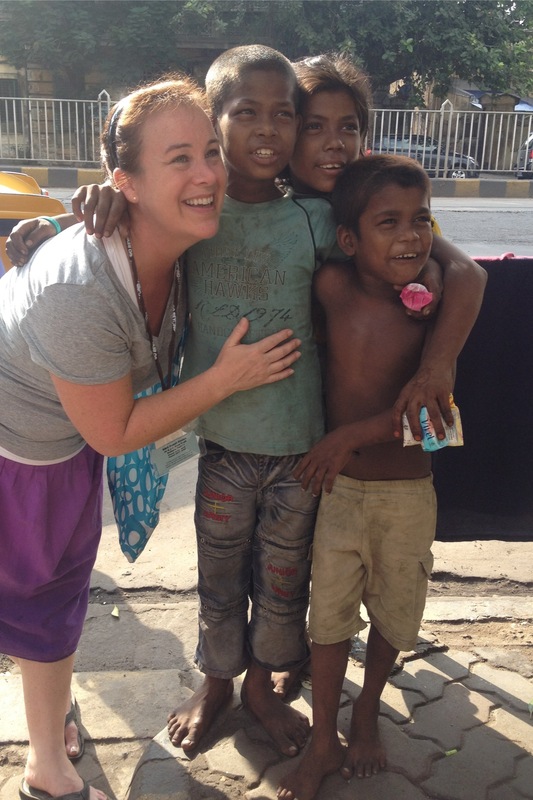 I was able to snap a quick photo of Amy, my assistant, with these homeless kids. One look at their faces is all it takes to realize that they too long for the same love and acceptance that we all want. We are grandparents of Kalie Simmons and In-laws of Julie Simmons. It has been our privilege to pray for your entire group, but we have benefited greatly from your e-mails each day. May God continue to reach out to the poor and hurting people of Kolkata through your special mission trip. Thanks a million for your prayers for our team. I am so glad to have Julie and Kalie on our team and that they have the opportunity to share this experience together. They are making memories to last a lifetime. Sooo wonderful!! & love the picture of Amy–tell her hi for me. Praying & thinking of y’all!! 6th grade mission trip is going awesome!!! Thanks for your prayers, Kristin. I will pass along your greetings to Amy. So glad to hear all is going well with 6th grade mission trip. One of the students with me reminded me that I had led their 6th grade mission trip years ago and now I am with them in India! Very cool to see how God continues to work in the lives of these students. Oh my goodness the love on Amy’s face matches the smiles on these children – thank you for sharing with us. Give Amy a hug from me to pass on to some one in need. We continue to pray -we miss you all but are thankful you are there! Thanks, Sandy. Amy is in her element here. I’ll pass on your greetings. I love reading about how God is working through the kids. As I read I miss Kolkata so badly, but thank you for blogging because in some weird way I feel I am there as I remember the faces engraved in my memory. If you remember… Tell Zeenat, Anita, and Debra hello for me and I miss them terribly. Hey, Sterling. I will pass along your greetings to our wonderful translators. They are such a blessing to our team. Thanks, Dan and Kim. We are so happy to have Devon on our team. She is having a great time serving in Kolkata. Thanks for praying for our team. What a great photo! Such a blessing to see. Your posts are a constant inspiration that I look forward to. My prayers are with you and your team as you travel and serve the Lord. Always good to hear from you, Chad. Thanks for your kind words and for your prayers as we serve in Kolkata. Blessings. Pastor, Our girls at Mahima too have expressed the same feeling of how much they enjoyed their time with the girls and they felt sad when they left. I want to thank your team and also those back home who put together the ‘Jammies for Justice’. The Mahima girls are blessed to have you all on their side. May God bless you and your team for the joy they have brought to the lives of these girls in Mahima. We love you. It was so good to see you again, Smita. Our girls enjoyed their time at Mahima and learning about the good work that you are doing there. Thanks for hosting our girls. We look forward to seeing you again on future visits to Kolkata. We love you and thank God for you.